Among all contributed student papers, the best papers written and presented by master and PhD students will be awarded. Submissions originating from a PhD thesis can be submitted. The PhD thesis must either be in progress or it must have been finalized no earlier than 2017. The author of the paper needs to be subscribed at a university. Submissions are submitted using the category "Student Contests - Best PhD Paper". The paper format corresponds to the paper format of regular submissions. Submissions will regularly be reviewed and - if accepted - papers will be selected for oral or poster presentation. As regular submissions, accepted PhD papers will be published within the IOS Press proceedings or in Applied Clinical Informatics. Depending on the reviewers' recommendations, the best PhD submissions will be selected for the Best PhD Paper finals. 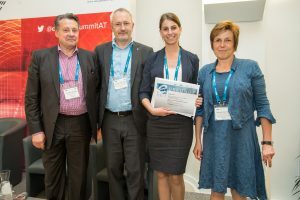 From all finalists, an independent jury will elect the winner of the Best PhD Paper Award, based on the reviewers' evaluations, the written papers and the oral presentation. Submissions originating from a master thesis or equivalent can be submitted. The thesis etc. must either be in progress or it must have been finalized no earlier than 2017. The author of the paper needs to be subscribed at a university. Submissions are submitted using the category "Student Contest - Best Master Paper". The paper format corresponds to the paper format of regular submissions. However, papers can be submitted both, in English or in German. English submissions may be considered for inclusion in the IOS press proceedings, depending on the quality. German submissions cannot be included in the IOS press proceedings, they will be displayed at the conference website. Submissions will be reviewed in a separate review process and - if accepted - papers will be selected for oral or poster presentation. Depending on the reviewers' recommendations, the best submissions will be selected for the Best Master Paper finals. 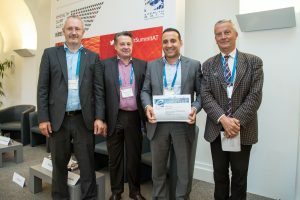 From all finalists, an independent jury will elect the winner of the Best Master Paper Award, based on the reviewers' evaluations, the written papers and the oral presentation. Development of text mining based classification of written communication within a telemedical collaborative network.